Taking on the Eden’s Gate cult alone is no fun – fortunately then, Far Cry 5 is packed to bursting point with allies who will drop everything to come to your aid. 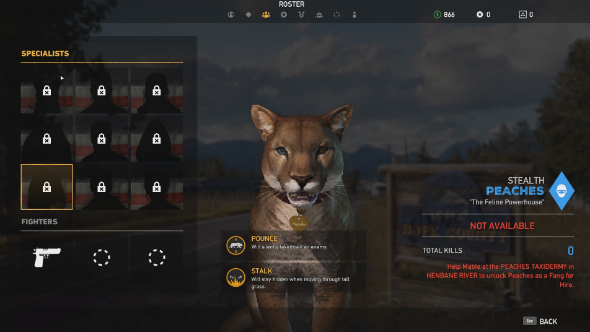 Whether that assistance comes in the form of a powerful mountain lion called Peaches or a redneck explosives expert called Hurk, a helping hand in the hostile open world of Far Cry 5 is always welcome. 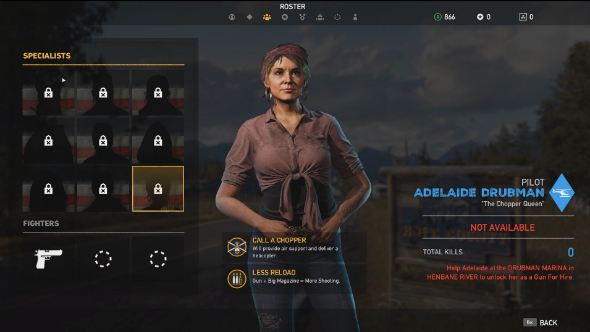 Far Cry 5 specialists can be recruited through the Guns For Hire and Fangs For Hire system in which you head out into the world and complete bespoke missions to earn the trust of characters who can then be called on to help you whenever you need them. Just picked up the game? Here is every Far Cry 5 perk and how to earn Perk Points. 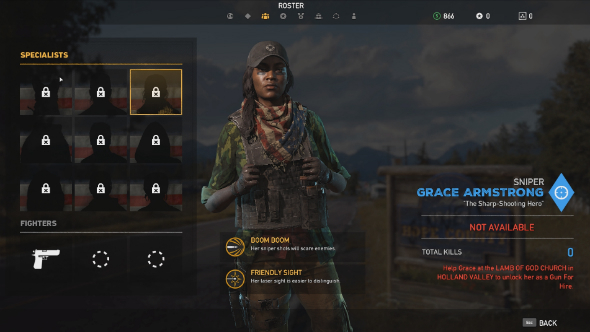 There are nine Far Cry 5 specialists to recruit throughout the game’s open world, ranging from stealth experts and mighty animals, to pilots and sharpshooters. Each Far Cry 5 specialist also boasts a selection of abilities that define what they can bring to battle. 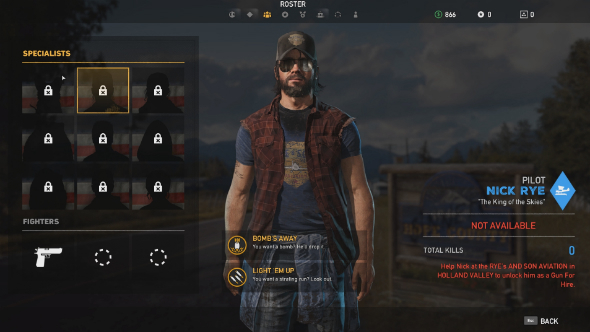 We have been busy expanding our army of rebels to show you all nine Far Cry 5 specialists as well as a walkthrough for unlocking each one. 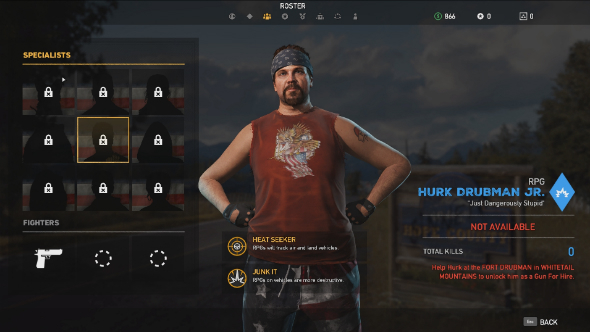 How to unlock Hurk Drubman Jr.
Boomer should be your first Far Cry 5 companion as he is easy to recruit and can be found very close to the starting point of the game. Once you have finished up liberating Dutch’s Island, open up you map and look a little southwest for Boomer’s icon over Rae-Rae’s Pumpkin Farm. Head there and start capping cultists – there are not many so don’t worry too much about going in unprepared. Then let Boomer free and give him a pet to earn his loyalty forever. Boomer is pretty weak as a Fang for Hire and cannot climb into vehicles with you, but he makes up for it with his scouting prowess, ability to pinch guns, and his knack for scaring off bears, which is very helpful early on when you do not have the best weapons. To unlock the assistance of pilot Nick Rye you will need to head to Rye’s And Son Aviation in Holland Valley and kill all the cultists you find there. Nick will emerge and you will be able to speak to him and start the Wingman Gun For Hire mission. You will need to liberate Nick Rye’s plane, which is at Seed Ranch to the west – capture the outpost silently as this can be a tricky base when reinforcements are added to the equation. Head to the hangar once every enemy is dead, enter Rye’s plane and fly it back to him. There will be a flying tutorial and some targets to destroy along the way so take this opportunity to practice your aerial combat skills. Take care with the landing, hop out, and eliminate all cultists in the area – then speak to Nick to complete the mission and earn his support. You can start the Grace Under Fire Mission by heading to the Lamb Of God Church in Holland Valley. There will be a smattering of enemies to eliminate at the church – head up to the bell tower when they are all dead to speak to Grace and start the Gun For Hire mission proper. This is a simple but tough mission – you have to help Grace defend the church, while not damaging any of the gravestones. There is a sniper rifle with Grace that you can use, this should also help you avoid damaging any of the tombstones. The final enemy boasts a flamethrower and armour, so take your time and keep your distance to finish this quest in one piece. No other Far Cry 5 specialist can match CHeeseburger when it comes to sheer destructive might. You can find this massive grizzly at F.A.N.G Center in the north of the open world world – head there and liberate the base, but be warned there are heaps of enemies, including pet wolves and a chopper to deal with. Once the dust has settled speak to Wade, who will reveal that he set Cheeseburger free ahead of the cult’s arrival. 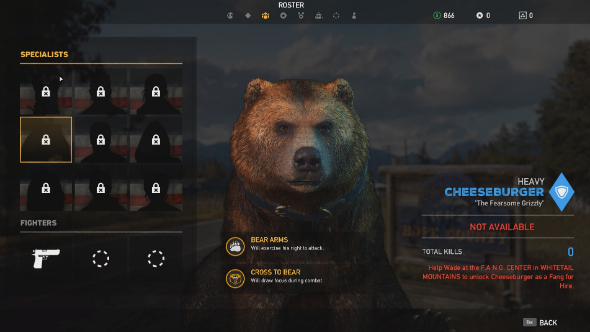 This will start the A Right to Bear Arms quest, which requires you to do a spot of fishing in order to gain Cheeseburger’s affection – there will be a marked spot on the map and a tutorial to follow. 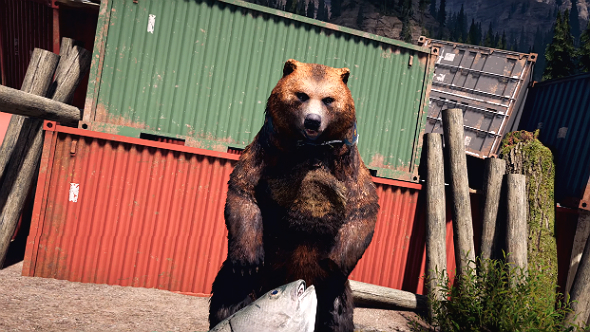 Once you have a salmon, head to the next spot on your map, which is where you will find Cheeseburger. Kill a couple of cultists, give Cheeseburger the salmon, and then ready your weapons as you will have to fend off a large group with Cheeseburger’s help. 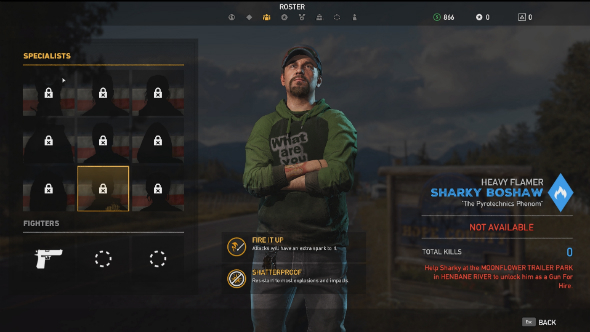 Far Cry 5 Hurk Drubman Jr.
Explosive expert Hurk has a suitably explosive Gun For Hire mission that you can start by heading to Fort Drubman and speaking to Hurk’s dad. You need to recapture Hurk’s dad’s campaign truck – this starts off slow with a lengthy car ride, but it’s not long before you are tasked with taking out a watchtower, ziplining to another base, and seizing control of the campaign truck, which is a jeep with a heavy machine gun on the roof. On the drive back you will need to keep the jeep safe with the help of the turret, which is nice and easy. Once back Hurk’s dad will order him to assist you whenever you call on him. 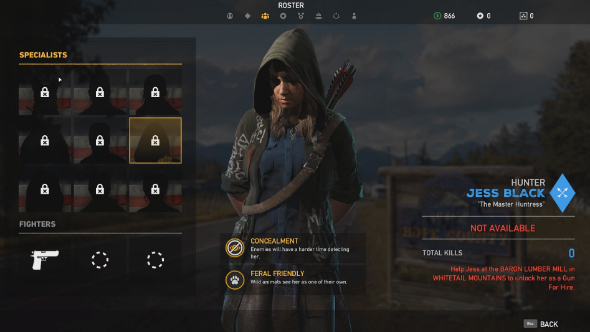 To unlock Jess Black you will need to start the A Dish Best Served Cold mission, which can be started by heading to Baron Lumber Mill in Whitetail Mountains. This one is simple, you just need to accompany Jess Black on revenge quest against a mass murdered called The Cook. There will be several groups of cultists to quietly defeat on the way and liberate a couple of small hostage camps without getting them killed – the final showdown is pretty tough with The Cook able to tank a lot of damage, so make sure you are well prepared. Once all the cultists and The Cook are dead, talk to Jess Black to cement your camaraderie. In the northwest region on the map you will find Peaches Taxidermy, which is home to Mable. Speak to her to start the Here, Kitty Kitty mission that sees you hunt down a camp of Eden’s Gate cult members and return Peaches the tamed mountain lion to Mable. You will need to collect some of Peaches’ favourite treats before leaving and then throw them down once you have freed Peaches to lure her back home. 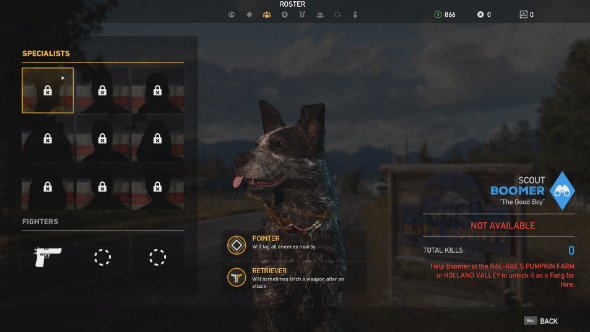 Peaches is a great Far Cry 5 Fangs For Hire recruit if you want something stronger than Boomer, but stealthier than Cheeseburger. Peaches can scare off wolves as well, which is handy as the canines can become a nuisance when roaming through woodlands. Burn, Baby, Burn! is the name of the Gun For Hire mission that unlocks heavy weapon specialist Sharky Boshaw. Head to Moonflower Trailer Park in Henbane River and chat to Sharky, who is on the roof of one of the trailers. Here you will have to gun down an advancing horde of drugged cultists using the supplies Sharky has stashed atop the trailer. Next you need to turn off a set of speakers in order to stop new cultists showing up: simply sprint to the marked switches and activate, quickly eliminating any enemies in your way. Head back to the trailer and talk to Sharky and he will offer you his assistance indefinitely. Head to Drubman Marina in Henbane River to start the Friendly Skies Gun For Hire mission – as ever, you will have to slaughter a bunch of cultists before you can reach Adelaide Drubman. Speak to Adelaide and dissuade her from going after her stolen chopper, Tulip. Rescuing Tulip is your job, naturally. She will give you two locations to scout out: Misty River Gas Station and Taft Lookout Tower. Head to the gas station, find the pilot who stole the helicopter and silently eliminate them with a bow or silenced weapon. Next up is the lookout tower, again silently hunt down another helicopter pilot then murder the rest of the cultists in the area. Use the lookout to find the stolen chopper, capture it, and pilot it back to Adelaide. Once there, you will have a few more cultists to take care of – speak to Adelaide when they are all defeated and you will have earned her support.